Southeast Asian refugees represent the largest refugee community ever to be resettled in the United States, after being forcefully displaced by U.S. war and its aftermath in Laos, Cambodia, and Vietnam in the 1970s. Refugees were often resettled in urban centers of concentrated poverty with few social or economic supports. Families struggled to help their children navigate failing schools and racialized bullying. Southeast Asian American young people were disproportionately swept into gangs and violence. As a result, today Southeast Asian refugees are at least three times more likely to be deported on the basis of an old criminal conviction, compared to other immigrants. SEARAC advocates for the dignity and rights of Southeast Asian refugees with old criminal convictions to stay together with their families. We fight for policy changes to restore fairness and flexibility to immigration laws that make deportation mandatory and irreversible regardless of the individual circumstances of each case. Our advocacy is grounded in the principles of fairness, family, and second chances. SEARAC also fights to preserve our family-based immigration system. On average, more than 90% of Southeast Asian Americans who received green cards in 2017 did so because of family-based immigration, with more than 22,000 families benefiting from extended family visa sponsorship of siblings, parents, and adult children in 2016. See our latest immigration-related news, reports, and fact sheets in our Resource Hub. A one-pager exploring the status of at least 14,000 people who face potential deportation. Basic facts, top-line messages, and tips to address media inquiries. A memo that discusses the current backlog for immigration visas and the ramifications of ending family-based sponsorship. Poverty, mental health, criminalization, and other statistics surrounding the largest refugee community in US history. A primer on laws responsible for the mandatory detention and deportation of Southeast Asian refugees and SEARAC’s recommendations on legislative fixes. This 2015 report exposes the school-to-prison-to-deportation pipeline and offers recommendations for addressing mass incarceration and deportation. In partnership with the National Council of Asian Pacific Americans, SEARAC is collecting family immigration stories to inform and guide our advocacy to protect family immigration policies. 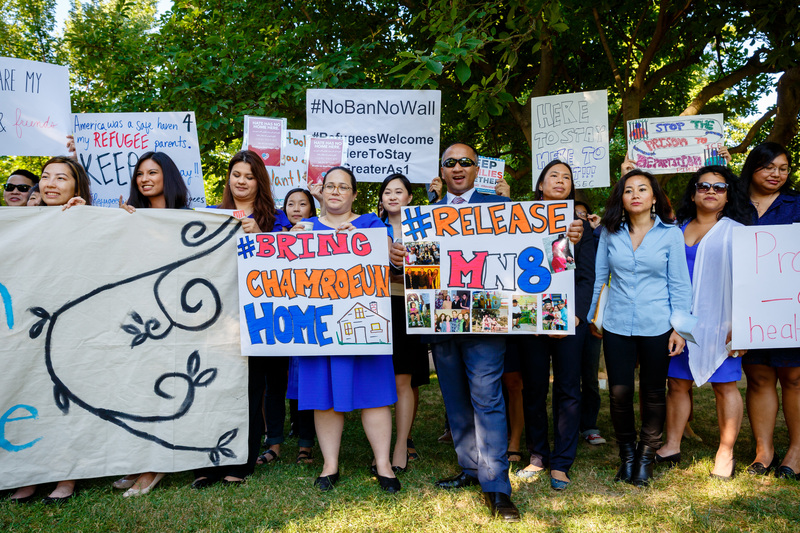 More than 100 Cambodian and Vietnamese community members were detained by ICE for deportation in the fall of 2017. If you or a loved one is impacted by detention or deportation, consider sharing your story with us to support our long-term advocacy efforts to reform unjust detention and deportation laws! Click here to access our deportation advocacy data collection form.